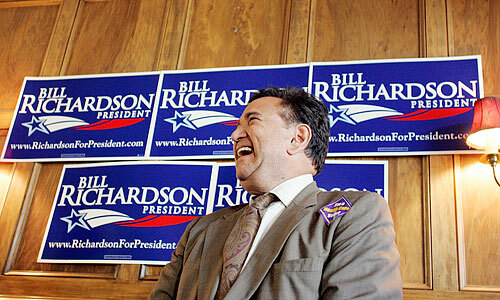 Democratic presidential candidate Bill Richardson, governor of New Mexico, leads a question and answer session at the Historic Boulder Dam Hotel in Boulder City on Tuesday, October 2, 2007. Richardson's Credentials: The celebrity and sheer cash of Sens. Hillary Clinton and Barack Obama and, to a lesser extent, former Sen. John Edwards, have overshadowed what many observers regard as the best resume of anyone running in either party. Bill Richardson spent nearly two decades grabbing mostly positive headlines as a hard-charging congressman, U.N. ambassador, freelance international negotiator and U.S. energy secretary during the Clinton administration. He leveraged his experience to the New Mexico governorship four years ago and won reelection last year with 69 percent of the vote, drawing support from a solid majority of independents and many Republicans. Yet Richardson has never managed to establish a national profile, thus his low standing in state and national polls. He points to his appeal in New Mexico and tells voters he can bring "new real estate" into the Democratic column, particularly in the formerly red Intermountain West. The son of a New England banker and a Mexican mother, Richardson grew up in Massachusetts and Mexico City — but spent most of his early professional life in Washington. He moved to New Mexico in 1978 because he wanted to run for Congress. If not a Westerner by birth, Richardson has embraced the region’s sensibilities and says he understands Western values and issues better than his rivals. He won the National Rifle Association's endorsement for governor and was the only Democrat invited to speak to NRA members in Washington this fall. So far, Richardson's agenda has won broad praise, even from The Wall Street Journal 's editorial page and the conservative Cato Institute. His first move as governor was to cut the personal income tax from 8.2 percent to 4.9 percent and chop the state capital gains tax in half. Still, Richardson has made gaffes large and small, telling an audience of gays and lesbians at a candidate forum that being homosexual is a choice and closing an impassioned speech to the Service Employees International Union political conference by thanking the wrong union. After admittedly stumbling in the early part of the campaign, Richardson is picking up steam, with Iraq as his signature issue. He hopes to surprise in Iowa and New Hampshire, with a strong showing in Nevada, building momentum before the Feb. 5 Super Tuesday primaries. His solution in Iraq stands in sharp contrast to those of his Democratic rivals — and, some say, damages his chances of winning the general election. He advocates withdrawing all U.S. troops immediately, leaving no residual forces. The stance appeals to the liberal activists and anti-war wing of his party, but might hurt him with independent voters. Place of Birth: Pasadena, Calif. Notable: Before he was a four-time Nobel Peace Prize nominee, Richardson was a star college baseball player. At the 2005 New Mexico State Fair, Richardson secured the Guiness World Record for most handshakes in an eight-hour period by a politician with 13,392. Sun Archives: Was Richardson for Yucca before he was against it? Richardson on the Issues: A look at where Richardson stands on the issues and how he has voted. State by State Contributions: A breakdown of Richardson's financial contributions across the U.S.
Richardson's MySpace Page: Read Richardson's profile information and leave a message. Richardson's Facebook Page: Read Richardson's profile information and leave a message. Richardson's Flickr Page: View Richardson's photos from the campaign trail. Campaign Manager: Dave Conarino and more key people. — Las Vegas Sun writer Michael Mishak and web content editor Andy Samuelson compiled this report.